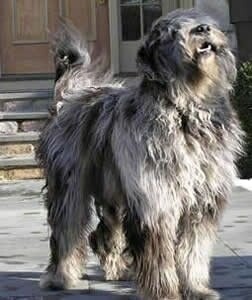 Actually, the Bergamasco coat requires very little care, except for the occasional brushing and bathing. You can even brush the Bergamasco when the dog is mature and the hair has flocked together! 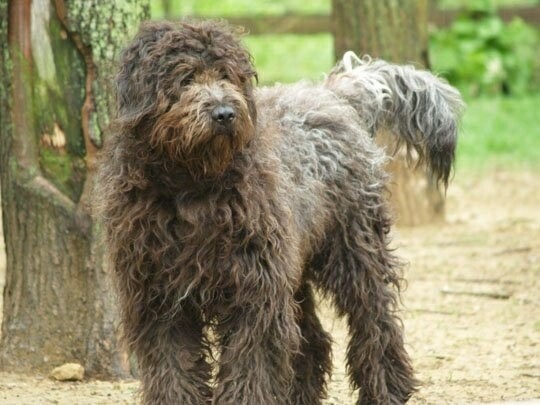 The Bergamasco coat is forever changing, from the adorable, soft, fluffy, puppy coat to the beginning flocking stage which may start as early as 8-9 months to 1 year old. When this flocking starts (which I call the tangled, messy look), it lasts till the dog is approximately two years old. At approximately three years old, the look that everyone has been waiting for has finally arrived! 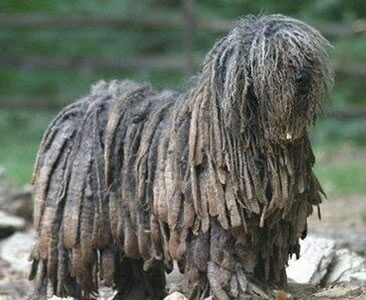 The Bergamasco's coat is made up of hair, not fur and is considered to be non-shedding. 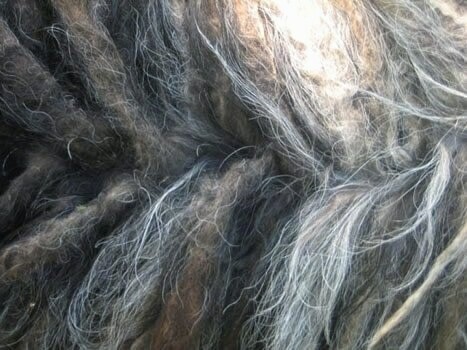 I would like to make it clear that the Bergamasco hair does not cord (cording is the twisting of hairs together to create a spiral strand). 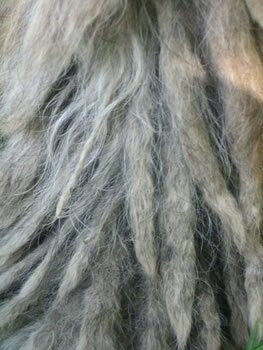 The Bergamasco coat is very different, in that the strands of hair weave together creating flat layers of hair (called flocks). 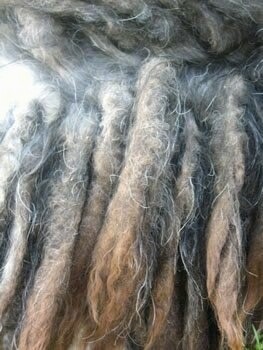 The definition of a flock is a tuft or lock of wool or hair. Each flock of hair ranges in width anywhere from inch and half to three inches wide. Before we can discuss each stage of coat development, one must first understand the formation of the coat. The coat is made up of three types of hair: 1. The undercoat: fine, dense and oily (not greasy) to the touch which forms a waterproof, protective layer. 2. 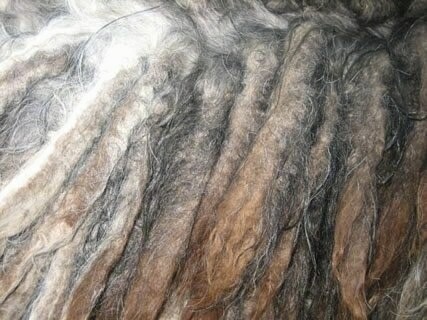 The goat hair: which looks like thin gray strands, is strong and harsh similar to coat of a goat. 3. The woolly top coat: which is finer and softer to the touch. 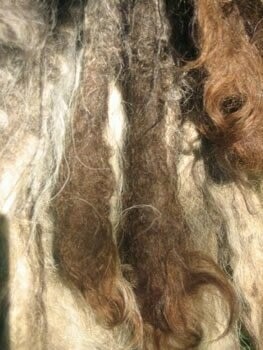 The combination of the wooly hair mixed with the goat hair weave together to create the flock. Each dog develops at its own rate depending on the dog’s genetics. Whether you have a gray or black-coated puppy, coat care is still the same. It is okay to wash your puppy once in a while or when the need arises, however, frequent bathing will dry out your puppy's skin and coat by removing the protective essential oils that keep the skin healthy and the coat clean. It is also important to keep your puppy free of any tangles or matting especially in the beginning, when the puppy coat is still present and the changeover has not occurred. A monthly brushing with a pin brush will remove most tangles and debris. 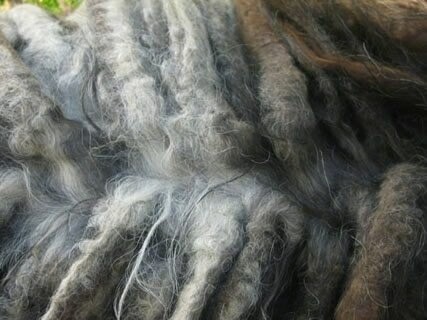 At around 8-10 months you will begin to notice the development of the longer smooth gray goat hair. This is the age the coat begins to get thicker, especially around the base of the tail. You will begin to notice thin smooth strands of gray hair along the back and base of the dog. This is what we call the goat hair. Now the beginning stages of flocking can occur. 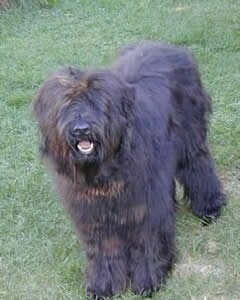 The goat hair together with the undercoat and the wooly coat come together to form shapeless clumps of immediate concern for the first time Bergamasco owner. 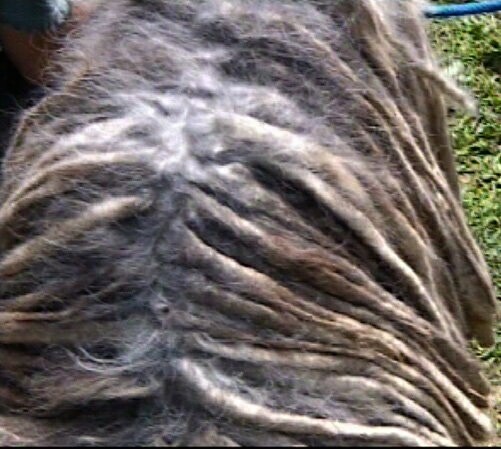 Suddenly most Bergamasco owners panic at this initial matted flocking that can be felt near the skin, more than seen by the eye. Most owners have found these initial flocks by having their brush no longer usable in the hair. From this point on it is very important to put aside the brush and manually groom your Bergamasco by running your fingers through the dog's coat while relaxing in the evening. Your dog usually prefers your touch over any hand-held tool and is an excellent way to form a close bond with your Bergamasco. 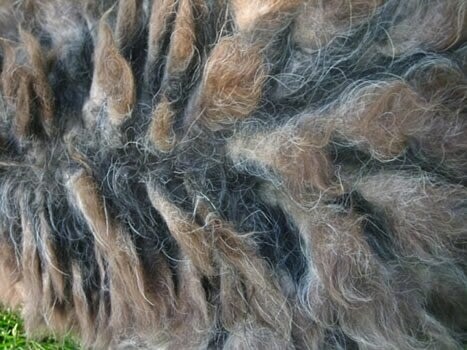 Sometimes in the early stages of the development of the flocks, there can be more wooly hair than usual, causing the softer finer puppy hair to mat close to the skin. This type of mat should not be at this stage. It is important to separate these areas by hand as though true flocks are taking shape so the skin is not pulled. When the flocks begin to take shape, you will notice the base of the flock at the skin is never woven, but is straight non-woven strands of hair. This naturally creates a space between the dog’s skin and the beginning formation of the flock so as not to pull the skin and also allows air to the dog’s skin. 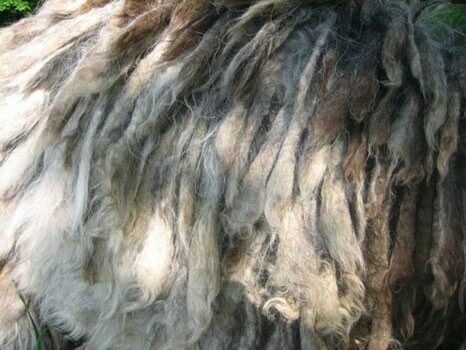 This is the reason the Bergamasco Sheepdog is not plagued with skin problems. (It also important to note at this stage one must limit bathing to necessity only; when the coat gets wet the hair will become tighter and tighter to the skin, almost like a wool sweater shrinking), which makes it very difficult to separate into smaller groupings. What one must do to the clumps of hair, (new flocks) if larger than 2-3 fingers wide, or if there are different areas of hair binding together ( literally creating matting and skin pulling), is to simply tear the flocks by your fingers from the loose end (hair not attached to the skin) down to the skin. It is not important to worry about the shape or direction of the mats when tearing, but simply to avoid the coat from forming a solid mat over the body. It is important however at this stage not to make the flocks too thin, for eventually the thin flocks can break and fall off. It is better to have larger width flocks than smaller ones. As the Bergamasco flocks get longer with age, the sheer weight of a too thin flock will cause it to break off or it can also be pulled off through typical dog play. A Bergamasco a with thick wooly coat can be a quite an adventure, constantly splitting and re-splitting the coat to help set up the initial flocks. Many Bergamascos have coats that require minimal initial or ongoing care. Believe it or not, once you have set the initial flocks they are taking shape everyday as your dog matures. Remember each flock will be different in width and texture depending on how the ratio of the three different types of hairs intertwine together. 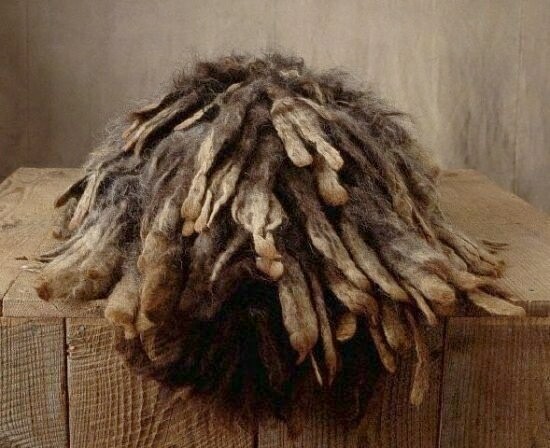 On a typical Bergamasco's body you will notice the distribution of various types of hair is not consistent. On the base of the tail, rear section of the trunk and the limbs, there is a vast amount of woolly hair. You will generally notice woolly hair throughout the dog’s coat with the exception of the shoulders to the thorax where there is only goat hair and the hair in this region has a smoother texture. Generally speaking, when the Bergamasco is starting to flock, check throughout the body, down to the skin, by separating the hair with your hands to make a visual inspection. During the first year large mats can develop behind and underneath the ears and need to be torn into smaller flocks by hand. The limbs and chest need to be watched carefully as well. We also check underneath at the front and back armpits to make sure there aren't any mats pulling the skin. The same method applies; tear too large groupings into thinner flocks by hand. This is the period when the dog's flocks begin to appear separated and will have a flat fan-like appearance in shape and are visibly noticeable on the top line, although short in length. One must watch carefully for the flocks not to become too thick or wide or too thin. If the flocks become too wide it is important to separate them into the chosen width using the previously discussed method of tearing from the loose top end, down to the skin. The splitting of the too large flock should always be done by the hands, however, if need be a scissors will work as an extreme last resort. 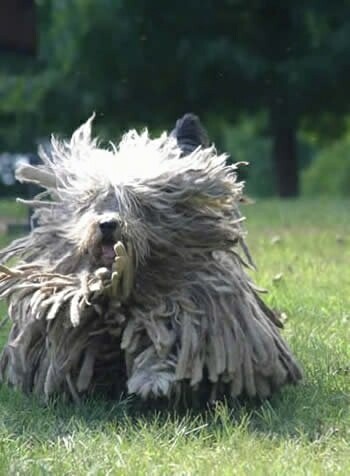 Someone may actually come up to you and comment, “Is that a Komondor or a Puli?” Ah, you say to yourself, finally my Bergamasco is becoming a Bergamasco! Once you have reached this period, it is home free, so enjoy and watch as the flocks continue to grow throughout the dog's life. As your dog matures, length and multi-layers of flocks will magically appear before your eyes. The Bergamasco coat at this stage should now be Bergamasco's own with the flocks well developed, beginning from the top line and eventually settling on the sides of body. If you find a flock a little too thin you should do nothing; eventually it may attach itself to another one next to it. It is important though, to keep a watch on the coat and split any flocks that become to too wide in width. One should be aware that generally the flocks are not the same size everywhere on the body of the dog. Generally, the flocks on the saddle and base of the tail are thicker and wider due to the abundance of the wooly coat. However, in areas around the shoulder and neck there is very little wooly hair, only goat hair creating a smooth saddle. On the chest the wooly coat is not as thick, therefore the flocks should be thinner and not as wide as those on the trunk of the dog. One must remember that the amount of wooly coat and goat hair varies on different parts of the dog, creating different size flocks throughout the dog’s body as well as the dog’s limbs, where the flocks should all be uniform in size, hanging loosely to the ground. On the head area around the eyes and muzzle, the hair is softer, hanging loosely over the eyes. The hair should always cover the eyes creating a visor which protects the eyes from the sun rays. 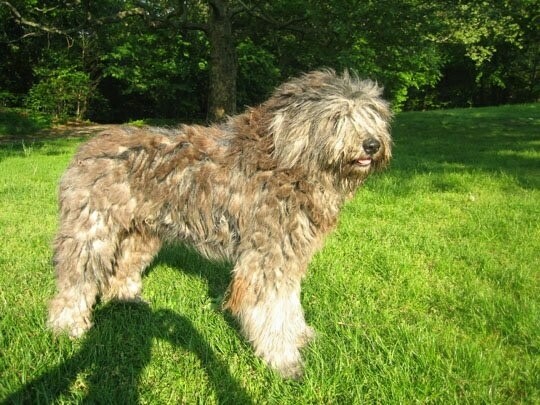 It usually takes up to five years for the Bergamasco coat to fully develop into layers upon layers of flocks that extend from the dogs shoulders to their paws. 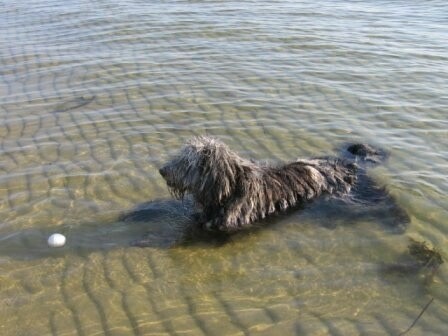 The Bergamasco is generally a very clean dog, therefore it is only necessary to bath 2-3 times a year. The hair has natural oils that create a protective layer that help make the coat water and dirt resistant. Without oil as natural protection the hair becomes dry and absorbs water as well as dirt more easily. The natural skin oil protects against dryness of the dog’s skin. When the need arises you can spot bathe your dog in areas more frequently dirtied such as the whiskers, and under the mouth, where food particles can accumulate. Other areas where dirt may be found are the paws, fronts of lower limbs, underneath the dog and behind the tail area where you may find dry feces. 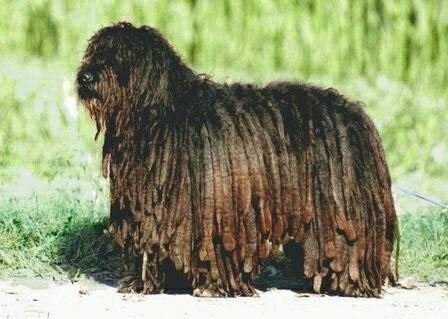 When washing your Bergamasco it is important to use lots of water and gentle shampoos. There are now some excellent soap-free shampoos on the market today; the advantage to a detergent-based shampoo is that no residual detergent is left in the hair. When washing the coat, use plenty of warm water wetting all the layers of the coat, especially the underneath layers. While rinsing, it is important not to leave any cleaning residue in the coat by constantly flooding the flocks with water while squeezing or twisting the flocks to help remove as much water as possible. The flocks, like a sponge, absorb a lot of water; the more water you can squeeze the faster the drying process will be. It is always best to bathe your dog on a breezy warm day, so drying time can be kept to a minimum, otherwise it can take two to three days to dry a full-coated Bergamasco. If you use a hair dryer, never use a dryer designed for humans; the heat is too hot for dog hair and can severely damage the coat. It is best to use a commercial grooming dryer that offers different air flow attachments and has various temperature ranges. Many people ask, “Can you brush that coat?” The answer is yes. An adult Bergamasco as well as a puppy can be brushed. A puppy should have a monthly brushing to help remove small tangles and debris. A pin brush should be used to brush the puppy coat. A pin brush will not harm the coat or take out the undercoat. A slicker brush can be used on a fully flocked and coated Bergamasco. The slicker brush will not damage the dense adult flocks; it will only remove the surface dirt that settles on the outside of the flocks. It is also very healthy to brush the adult coat occasionally, at this stage the adult dogs seem to enjoy the brushing and it helps keeps the coat nice and tidy. There is nothing more beautiful than the watching the movement of the Bergamasco with all its flocks flowing through the air. I have always said that the Bergamasco, unlike other breeds is always changing year after year, from the adorable, fluffy puppy stage, to the tangled youthful rebel stage, to the Beautiful Mature Majestic Bergamasco we have come to know and love. The preventive technique: first get some thick human hair elastics. 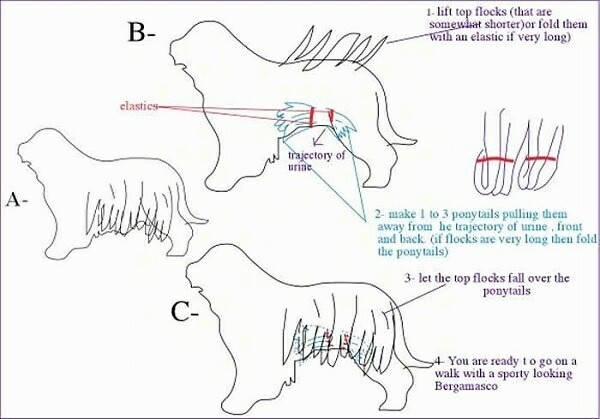 Each time we go on walks we pull the flocks (the ones that are in the trajectory of the urine) toward each side of the body and make ponytails (1 to 3 elastics each side depending on the stage of the coat), from the belly, the side and some from the leg. The ponytails are made high enough so when the dog lifts its legs there is no (or a minimal) hit on the flocks. Since the coat on the top of the body is long, it hides the ponytails and the dog looks as if he has a sporty hair length (at least he does not look too ridiculous). You can buy the elastics at any drug store or hair accessory department; the best ones come from afro-hair websites where they have some specialized for people with braids or dreadlocks. I use the same elastics on the rear, pulling the hair in side ponytails whenever any of the dogs have diarrhea. Mix baking soda with a mild dish detergent and some peroxide (the external use one that you can find at the drug store). Use enough baking soda powder so the texture is a thick paste and not too soft. Cover the flocks that are soaked in urine with the mixture (avoid getting too close from the skin as it can absorb chemicals from the soap). Let it sit for 10 minutes.... the mixture will absorb the urine. Rinse thoroughly with warm water making sure you get rid of all the soap.... The rinsing is the most difficult part because you have to keep doing it over and over until there is no more foam. The peroxide acts as an accelerator if used in a small amount... Dr. Liisa D Carlson, DVM and Dr. James M Griffin, MD recommend the following amounts in their book: "Dogs Owner's Home Veterinary Handbook"
Personally, I use very little peroxide compare to them because I was concerned with discoloration of the coat... but I have never had any problems so far. Make sure to discard the solution from the container when you are done; the release of oxygen caused by the chemical reaction could make the container explode if closed.